With Christmas fast approaching, I wanted to set up a Christmas busy box or tinker tray for my youngest that would help keep her occupied, entertained and engaged over what can be an overwhelming time for little ones. 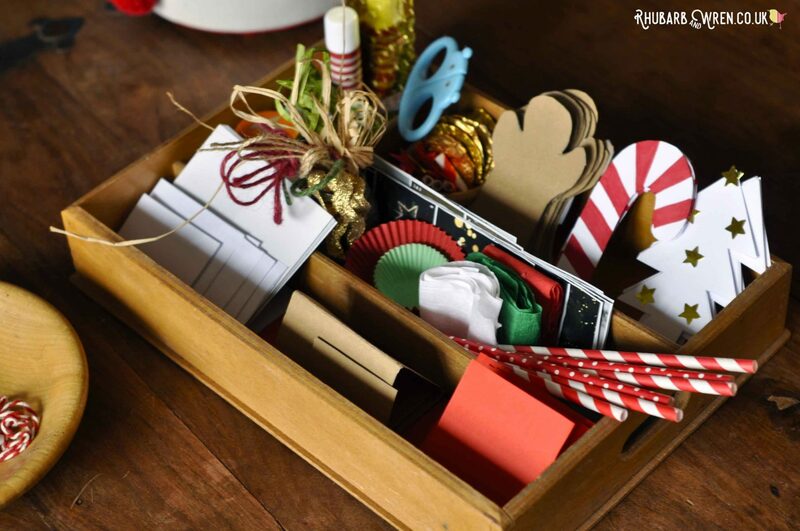 Our Christmas Busy Box was quick and cheap to put together, yet offers priceless opportunities for the kids to explore and create using the simple supplies set out for them – and with this on hand there’s always something to distract them and keep them occupied. 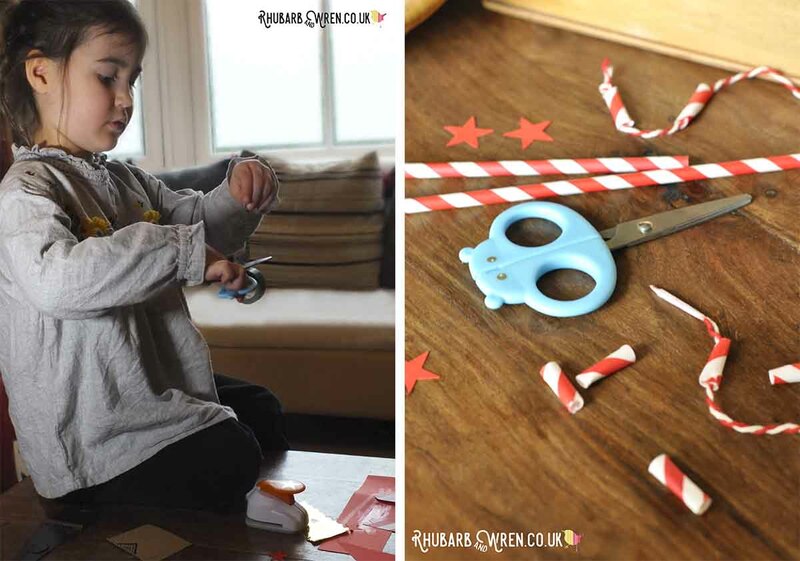 It’s so easy to do – and you can easily make one using things found around the house. Read on to find out how. 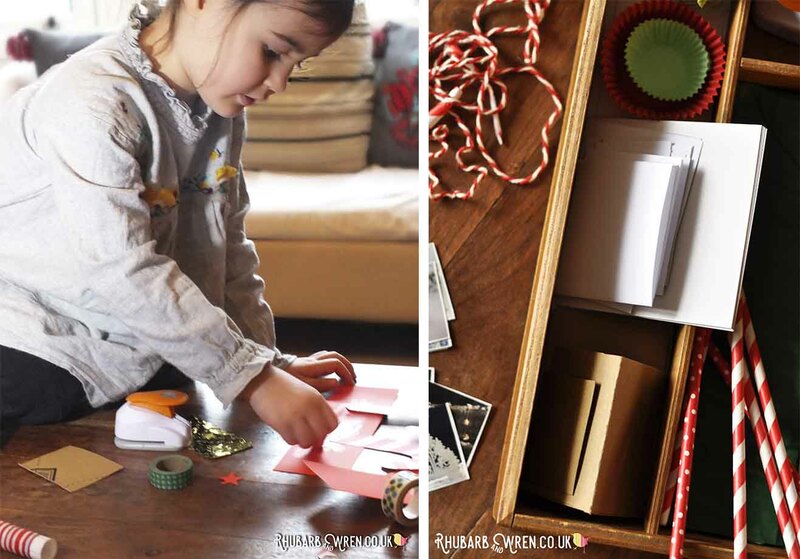 Putting a themed busy box of craft materials together is quick, easy and cheap! My kids and I love using this vintage cutlery tray or drawer that I picked up for a few pennies in a local charity shop – with its different compartments, relatively compact size and rounded handles, it makes the perfect portable tinkering station for all manner of activities. I keep the tray out or readily accessible at all times, and the kids know they are free to use the contents whenever they like. 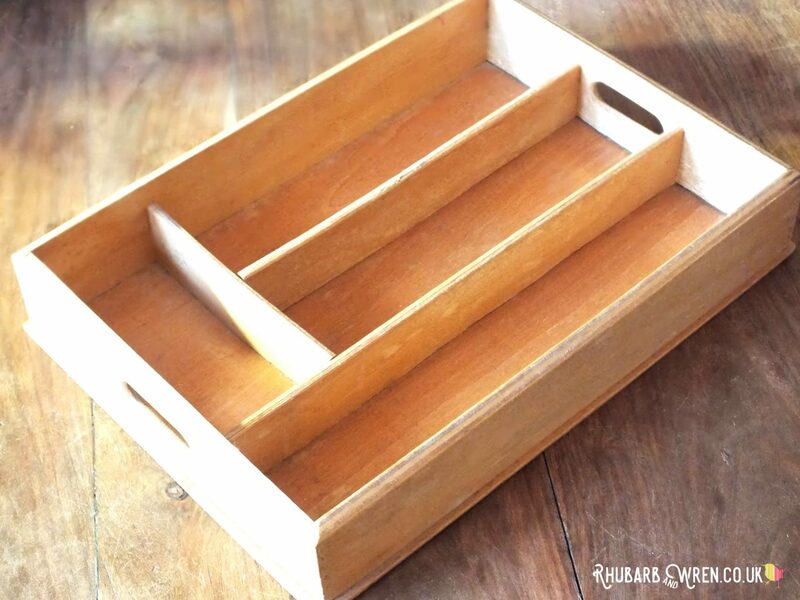 The different compartments in a cutlery tray make great storage for a crafts tray or busy box. As my youngest has been very keen on practicing her scissor skills lately, our tray has been getting lots of use as a ‘snip box’ – holding a variety of tools and bits for cutting up that allow her to exercise fine motor skills and build up the muscles in her hands by using scissors on all sorts of different materials. 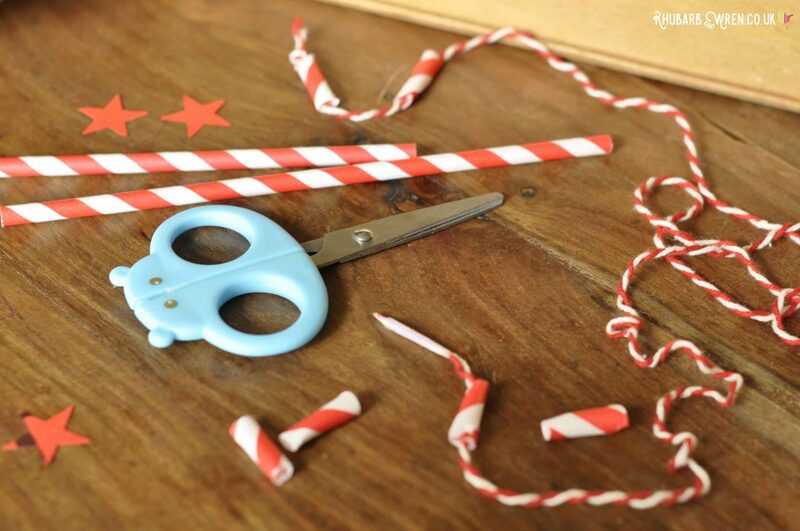 Decorative washi tape is great fun for kids to use, and can be made into simple beads too – just like these paper straws! I’m a great believer in providing kids with tools that are sharp – there’s nothing more frustrating for anyone than trying to use blunt scissors that don’t cut properly! We regularly remind ourselves of the rules for handling these safely while we work, and I find that the kids become very focused on their task when they know they are being trusted to keep themselves safe. A couple of different types of tools help gives lots of exercise to those different hand muscles so I like to include something like a hole punch along with those scissors. 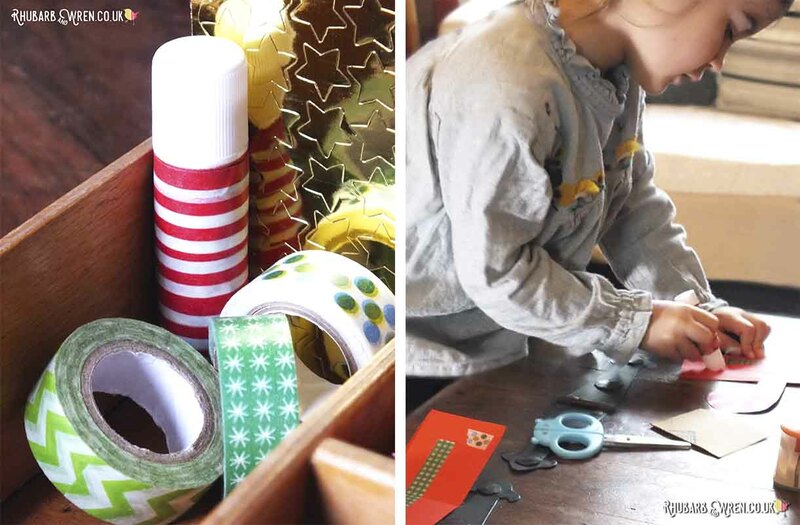 Applying glue and stick tape takes co-ordination and concentration – great skills to practice! To keep her interested in the tray, I often change things up and add new items – replacing those that have been used up and leaving new things in their place for her to discover and explore during play. For this christmas-themed tray, I extended the range of possible activities by adding a few other simple resources – a stick of glue, various different types of string; a star-shaped paper punch and some colourful, patterned washi tape. 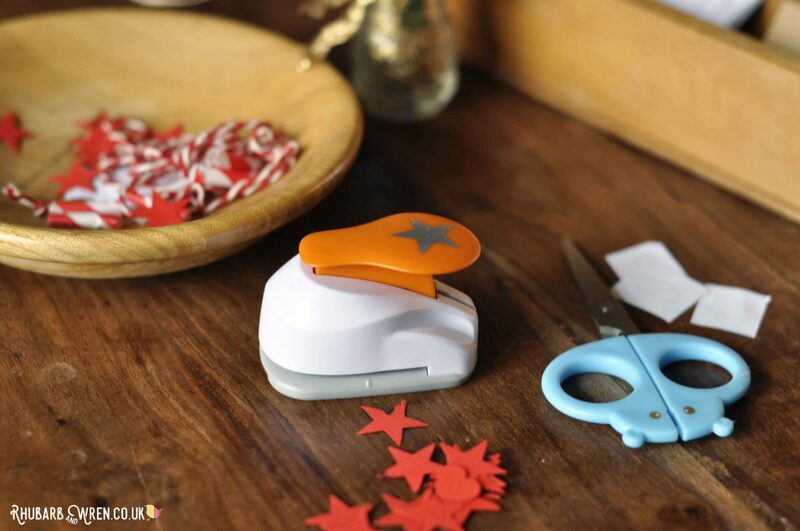 A hole punch is another great tool for young kids to master. 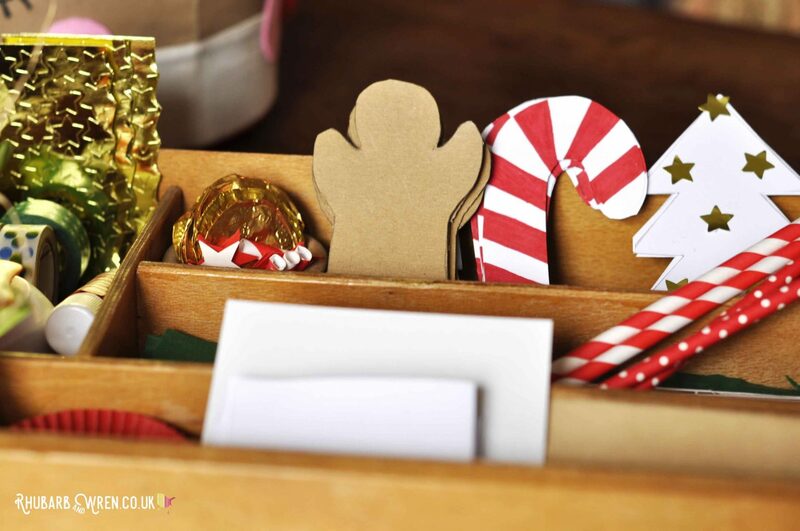 I also swapped out her mightily abused cutting materials for fresh supplies in the Christmas busy box – some with a christmas theme, like brown cardboard gingerbread men, and candy canes and christmas tree shapes cut from thin white card. As these get used up pretty quickly in various creations, I tend to add in new ones roughly once a week. 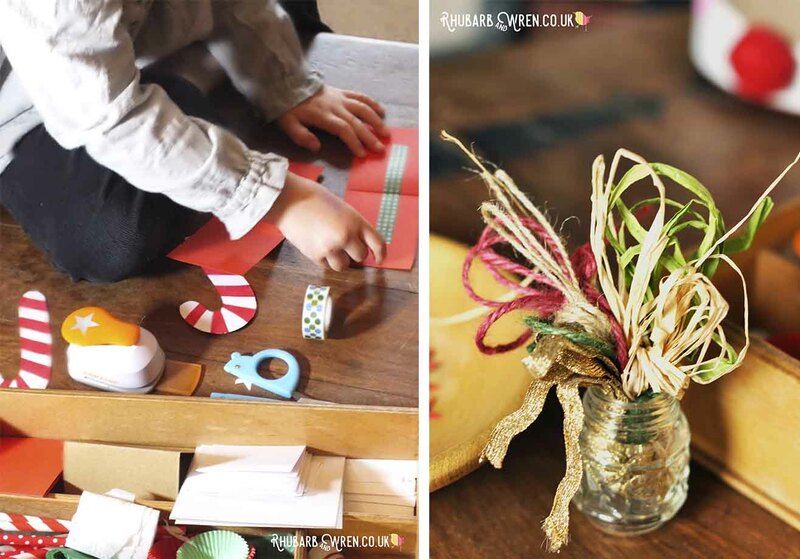 Colour, a little nudge towards christmas, and lots of options for making and playing! I made sure to put in rectangular and square slips of paper, card and tissue to leave her options open. Some of these I folded in half to make simple cards or booklets. Some were big enough to fill the entire length of a compartment. Some as small as a matchbox – and of course a few that were in between! The different sizes can be a prompt to inspiration just as much as more obvious shapes, and often the kids will make something that is directly related to the shape or size of the material. 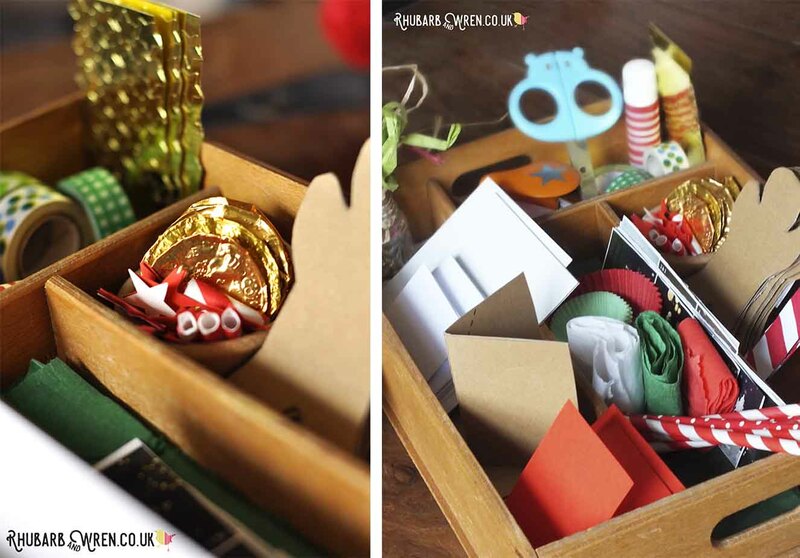 With a Christmas busy box like this, it’s great to offer lots of variety in the materials. So the bits of card and paper in our tray are not only different sizes and shapes, but also different weights and textures. Included (at the moment!) are thin brown cardboard from cardboard envelopes, tissue and crepe paper, copier paper – basically bits of anything you have lying around at home. I like to give a few bits of lots of different things, but you could also try offering a large quantity of the same sort of things (like a box full of cardboard tubes and a pile of sticks, for example) – what’s known in education circles as ‘heuristic play’. Magazines and catalogues are a great source for pictures to cut up. 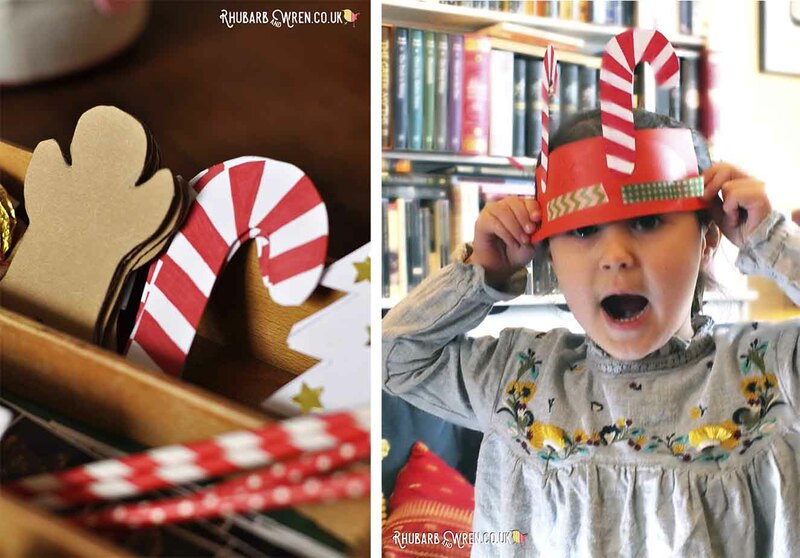 For more challenges and play options, I put in things like paper straws, cake cases, and bits of foil – I’m regularly adding gold foil wrappers as our advent calendar chocolate coins get eaten, for example. 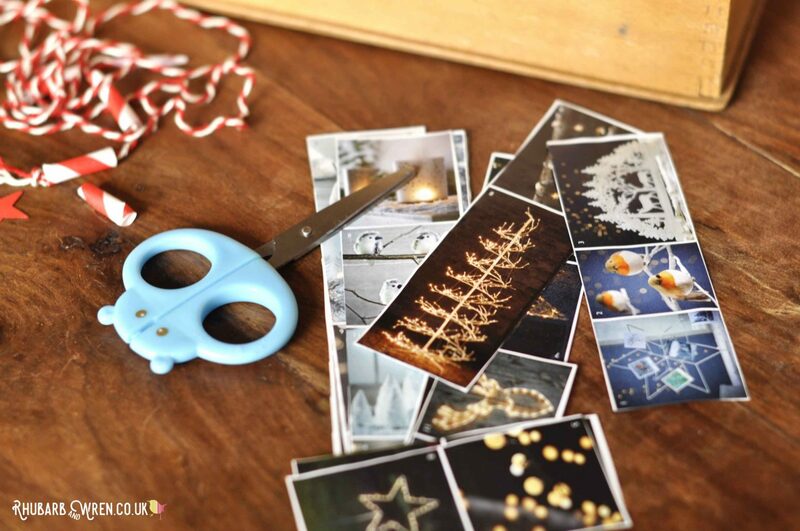 I’ve also cut out pictures and strips of images from catalogues for cutting out – they’re often in grids which make easy snipping practice for novice scissor users, and larger pictures can make great backgrounds for collage work. 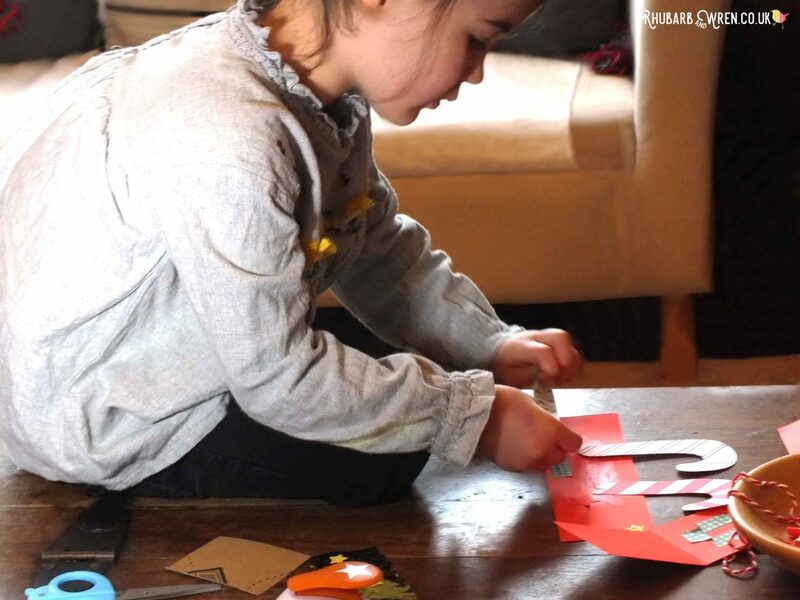 Folding a few bits of card makes a simple but effective activity prompt for the kids. Christmas time is a great time for collecting odd bits of packaging – I tend to build up a little stash of resources that I can add to the tray later, like crinkly shredded paper used for box fill, or corrugated card from a chocolate box (don’t judge me!!! ); scraps of wrapping paper and old Christmas cards are great (an oldie but a goodie) – as is anything that’s been foiled or glittered or a beautiful colour. Any Christmas wrapping that is shiny, textured, or with eye-catching images makes a great addition. My kids also love creating with teeny-tiny boxes, so whenever we come across these (often as packaging for food or things sent through the post) I add them in, along with some blu-tack, sticky tape or paper fasteners for a potential bit of junk modelling. As long as they don’t have sharp edges, tin containers or little bottles are also great for this – my rule is that anything goes as long as it fits into the tray. Sometimes they’ll get decorated, sometimes used in pretend play or made into a structure – it’s entirely up to the kids. Bits of string, twine, wool and raffia provide different textures and options in a Christmas busy box. And of course the contents don’t have to be man-made. In the warmer months we love to practice our scissor skills on things from nature, as I wrote about in our Nature Snip Box post. Now that it’s often too cold to sit outdoors to do this, we just bring these materials indoors. How about picking a few holly leaves and berries, gathering some little twigs or nuts or pinecones, or trimming a few bits off the Christmas tree? I find that the kids love incorporating these natural elements into their crafts. Bits cut and punched out can be used for all sorts of play and crafting. As our tray holds materials and tools that are left out constantly, it also works well as a resource centre for complementary activities. For example, I might bring out the kids’ stamps and inks, or maybe a batch of playdough, or some toy figures to use along with the Christmas busy box contents. The kids might make a playdough snowman with some buttons and twigs or pipecleaners; a beautiful little Christmas card with the stamps and paper; or a house for the figures. I usually don’t guide them – just leave the resources out for them to explore. Chances are they’ll come up with something I wouldn’t have thought of! Expect their carefully organised tray of goodies to become extremely disorganised while in use! Saying that, sometimes kids don’t know where to start – especially when presented with a new toy or activity they’re unfamiliar with. If I find that the kids aren’t engaging with what I’ve set out, I sit down and have a play myself. I find it works better to get them going than making suggestions on what they could do. When they see me sitting down at their level and doing something with their stuff, they are almost always intrigued enough to watch and comment on what I’m doing, then offer to help and very quickly will shoulder me out of the way to get the work done ‘properly’! Simple shapes allow children more freedom of choice when using materials. But if this doesn’t work, then maybe they’re not in the mood or just not interested right now in those things. So I’ll leave it and change it up by adding in or taking away some of the stuff later, to have a go at a different time. Sometimes what doesn’t interest them one day will be the bees knees the next, so I’ll try rejected resources several times and in different combinations before I give up on them. Sometimes it helps to leave a few hints for the kids on how they might use their materials. A tinker tray doesn’t have to be big or beautiful, and it certainly shouldn’t be expensive. If you’re tempted to try one out for your own kids, start by having a look at home for things you can use. And you don’t need a vintage wooden cutlery drawer – any container (compartmentalised or not) will do. Before I found this tray, we used a cheap wicker version that contained an assortment of nuts from the supermarket. And before that it was a plastic party tray. The kids won’t care – it’s the contents that will grab their imagination, and you can always upgrade it later when you find the perfect thing. 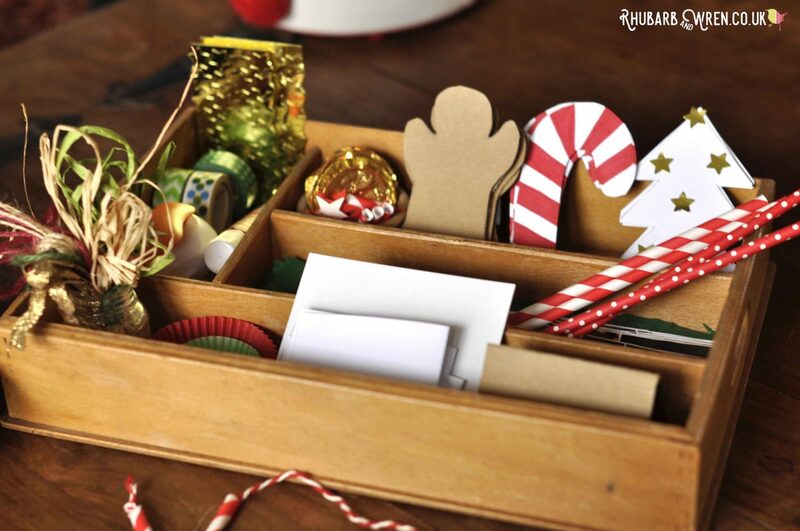 It’s called a busy box for a reason… Make a beautiful box full of lovely christmas crafts materials and activities, and the kids won’t be able to resist getting stuck in! You really can put together a busy box like this without spending a penny, just by recycling things from around the home. However, if you really want something similar to ours, and you can’t wait to find it in vintage, Amazon has a whole heap of affordable options. The links that follow are all affiliate links, which means that if you click through and buy, I will receive a small amount towards the running of this blog, without adding anything to the amount you pay. Thank you so much for your support! Remember that you don’t need loads of any one thing, and you don’t need to put everything out at once. Pace your supplies and you should find the kids coming back to expore new items with increasing confidence. Above all, have fun with it – and let them have fun too! Looking for more activities for kids? Take a look at some of our previous posts for other quick and easy ideas. Playing with play dough needn’t mean getting out a pile of plastic toys! Christmas, Scissor Skills, Tools. Bookmark. Happy Birthday Brick – Lego Cake Recipe! Absolutely – it’s so easy to change the theme, or leave it theme free too!